Rub your embossing buddy or dryer sheet over your Powder Pal tray or scrap paper and your transparency film sheet. spaced out on the scrap paper and set the punched circles aside. sheet will warp or melt, so be careful!! over the sticky strip of the Post-it note. Cut out the image as closely as possible. If using scrap paper, add a strip of Dotto behind your image. This will be your wing mask. Ink the wing stamp in StazOn ink and stamp it on the transparency film, a bit over the golden circle. Wait a few seconds then stick the wing mask right over the StazOn wing. Make sure the wing is perfectly covered. Ink the wing stamp in StazOn ink and stamp it near where you stamped the other wing, and remove the wing mask. You should now have a golden snitch! Author's Note: You should always remove StazOn ink from your stamps using StazOn cleaner. Ink your snowflake stamp in StazOn ink and stamp randomly between the snitches. 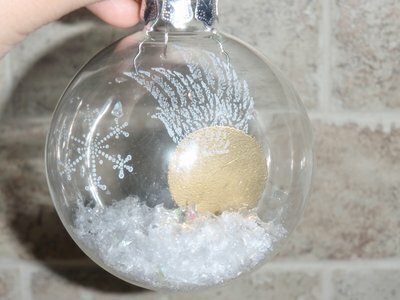 You can use more than one snowflake stamp to add a bit of dimension. thread a 6 to 8" (15 to 20 cm) silver cord through the hole. 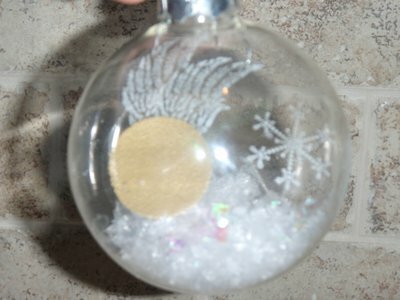 Remove the metal hanger and cap off the neck of the Christmas ball and set it aside. inside the glass Christmas ball. 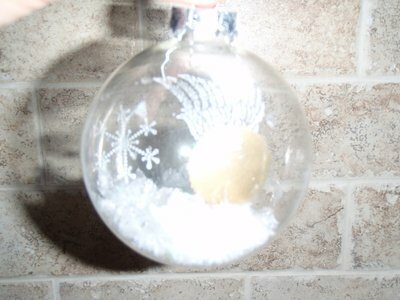 transparency will pop open inside the Christmas ball. cord in the glue dot and trim the excess cord using your scissors. ball if desired. Use silver cord to create a hanging loop. JosÃ©e Leblanc's tutorial was taken with permission, and was inspired by this tutorial.